I was sorting through photos on the computer this week and came across a video clip of the children from about five years ago. Oh my! 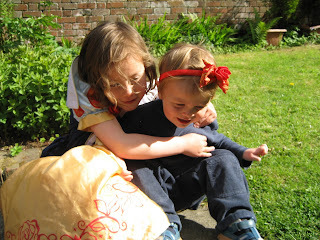 Just watching them giggling together and scampering around a sunlit meadow made my heart clench. I wanted to reach into the computer screen and pull those chubby little pootles out onto my lap. Those were the days when they were the beginning and end of my world. They took precedence over everything - my career, my ambition and sometimes even my sense of self. How have all those years shuffled by so quickly? My daughter starts secondary school in September. She is on the cusp of teenage-hood and yet she can still slip effortlessly into imaginary games with her younger brother. I watch them playing together and wonder if this is the last summer of innocence. At a recent new girls' day, one of the teachers explained how he too would have girls starting at the school. "I share your joy and your pain at watching them grow up," he told us. I am so proud at how far my daughter has come. I am also genuinely excited about the opportunities that now lie within her grasp: the literature she will devour, the mysteries she will solve, the drama of finding herself and launching that identity into the world at large. It won't be long before she becomes an independent person with dreams and projects of her own. So why the pain? Why do I look back and mourn the child that she was? Because back then, when she was soft and squidgy, when she talked with a slight lisp and bumbled about my feet, she was my creature! Nothing was so bad that a cuddle from me couldn't put it right. In her eyes - and her brother's eyes - I was quite simply the bee's knees. My flaws were invisible to them. They belonged heart-and-soul to me and my husband. As both children grow up and forge their own path, however, they will inevitably grow away from us. That is the heroism of being a parent - at some point you have to set your children free! Of course I am being slightly melodramatic. Both of them will continue to need us for years to come, although it will be a more complicated game of give-and-take, accompanied by a few arguments as they test the boundaries of our relationship. With these complexities ahead, I remain grateful that I can occasionally return to my rose-tinted computer screen and glimpse my babies tumbling about in the garden. No doubt as I spin through those elusive images, I will feel again that peculiar mix of joy and pain, that hankering for youth and that fear of growing old. I think it's called life. The classic children's story about the boy who never grew up and spent his days fighting pirates and cavorting with fairies in a never-ending childhood.